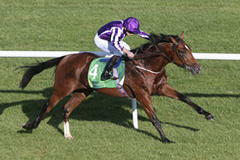 Saxon Warrior wins - Aidan O'Brien makes history! Saxon Warrior cemented his position as ante-post favourite for next year's Epsom Derby with victory in a thrilling renewal of the Racing Post Trophy at Doncaster. The son of Japanese great Deep Impact was something of a surprise winner when dominating his rivals on his Curragh debut in late August, but having proved that was no fluke by landing the Beresford Stakes, he was the 13-8 favourite to maintain his unbeaten record in a Group One his trainer had won on seven previous occasions. With Ryan Moore on his back, Saxon Warrior travelled powerfully for much of the one-mile journey, but looked booked for minor honours when the John Gosden-trained Roaring Lion swept to the front. However, he veered off a true line when push came to shove, giving Saxon Warrior a chance and he fought back admirably against the far rail to claim a historic victory by a neck. The winner's stablemate, The Pentagon, was third. The win gave Aidan O’Brien a new world record for the number of Group and Grade 1 winners trained on the Flat in a calendar year, finally beating the record set by the late American trainer Bobby Frankel in 2003. “It looked for some weeks like Aidan would create a new world record number of Group 1s in a calendar year and, now that he has, we shouldn’t allow what we thought was inevitable distract from the achievement: this is an incredible, historic feat and one worthy of great celebration,” said Horse Racing Ireland Chief Executive, Brian Kavanagh. Having set a new standard of 26 Group and Grade 1 victories, Aidan O’Brien now heads into the autumn and winter with many more opportunities to further add to his remarkable top-level tally. Indeed tomorrow (Sunday) at the French racecourse, Saint-Cloud, he is responsible for four of the seven runners in the Group 1 Criterium De Saint-Cloud and has one runner in the Criterium International.